An exhibition of paintings by the acclaimed California artist Sam Francis will be on view at Heather James Fine Art, Palm Desert, from November 15, 2018, through April 29, 2019. Drawing upon diverse influences including Fauvism, French Impressionism and Modernism, Color Field painting, and Japanese calligraphy, Francis is considered a central figure of the second generation of Abstract Expressionists whose pioneering style helped to establish the movement on the West Coast and internationally. Comprising over 28 paintings and works on paper, spanning from 1955 to 1994, Sam Francis: From Dusk to Dawn includes works from the Sam Francis Foundation, and Kaare Berntsen Collection, among others. Featuring 18 paintings completed shortly before the artist’s death in 1994 placed alongside more than 20 seminal works from 1955 through 1986, the exhibition chronicles how Francis’s lifelong dedication to exploring the many different ways color, space, and light can convey emotion and meaning advanced the standing of abstract painting both here and abroad. Standouts on view include Untitled, 1961-62, from his prominent Blue Balls series, which he first began in Paris during the early 1960’s, and A Whirling Square, 1975, a monumental oil on canvas from the collection of Francis’s daughter, Kayo Francis Malik, on view for the first time in over 20 years. 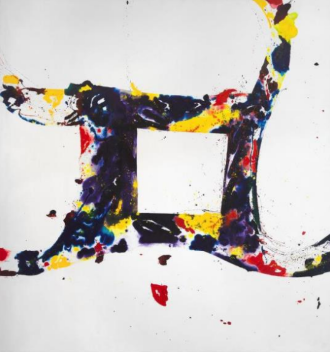 “Heather James Fine Art’s survey exhibition will shed new light on Sam Francis’s important contribution to abstract art,” said Debra Burchett-Lere, Executive Director/President of the Sam Francis Foundation, who has written an introduction for the accompanying catalogue. At 71, battling prostate cancer, confined to a wheelchair, and without the use of his right arm, Francis embarked on a series of small-scale abstract compositions, now known as The Last Works. Featuring bold biomorphic shapes intertwined with fervent pools and splatters of paint, the entire series of 152 paintings on canvas and paper filled the walls of his Santa Monica studio. Reflecting his signature vibrant color palette and sweeping brushwork, paintings from this series are imbued with both a sense of urgency and vitality. Shortly after his death, the Los Angeles County Museum of Art mounted Sam Francis Last Works, a complete recreation of the artist’s Santa Monica studio that included 18 of the paintings on view.